Stock #20J37 Model #54325-NN On Sale through 9/30/19. Stock #20J38 Model #54325-TN On Sale through 9/30/19. Stock #20J39 Model #54325-TC On Sale through 9/30/19. Featuring a dual right- or left-handed writing tablet chair and 360° rotation, Hierarchy Enroll from Balt makes collaborative room configuration a breeze! Wide tablet for student's comfort supports a Chromebook and a notepad. Tablet swivels to adjust to left and right hand students and includes a pencil or stylus holder. 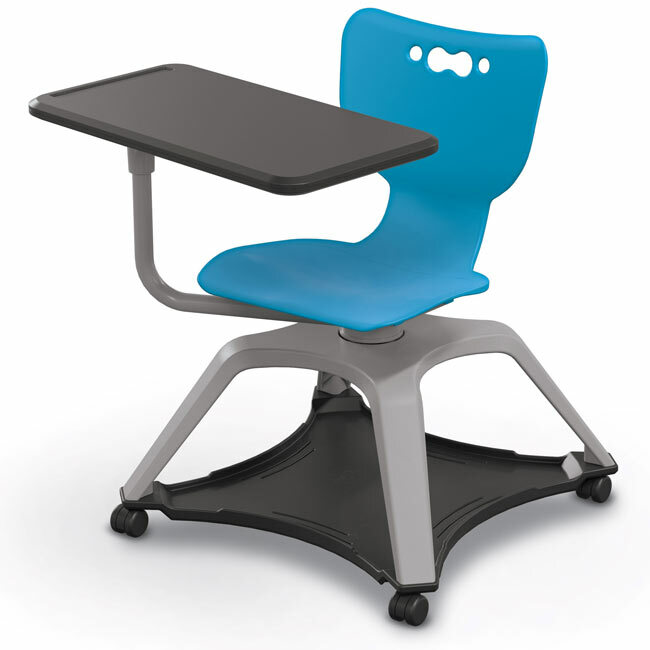 Utilizing the popular Hierarchy chair seat shell, this flexible seating option has a swivel seat allowing students to shift focus throughout the space and is available in the wide array of Hierarchy colors. The generous base can store backpacks and books to remove clutter from classroom aisles. Optional cup holder available that swivels to store under tablet when not in use. Select the non-tablet option, for use as a mobile swivel chair with built-in personal storage space.